A: Crowns are an ideal restoration for teeth, which have been broken, or have been weakened by decay or a very large filling. The crown fits right over the remaining part of the tooth, making it strong and giving it the shape and contour of a natural tooth. Crowns are sometimes also known as ‘caps’. • Having a very large filling may have weakened the tooth. • You may have discolored fillings and would like to improve the appearance of the tooth. • You may have had a root filling which will require a crown to protect it. • You may have had an accident and damaged the tooth. A crown maybe necessary as a support for a bridge. • Porcelain: These crowns are not as strong as metal containing crowns but they can look very natural and are most commonly used for the front teeth. • Reinforced porcelain: these crowns have a framework of zirconia, a very strong metal that is tooth colored and therefore looks very natural and can be used at the front or back of the mouth. The zirconia framework is totally biocompatible and therefore there are no possible allergic reactions. • Composite: Composite resin materials can sometimes look the most natural. However, these crowns are not as strong as metal bonded crowns and the color may not be stable. Allergic reactions are noted. • Glass: These crowns look very natural and are used on both front and back teeth, but again are not as strong as metal bonded crowns. • Precious metal (gold and palladium): These crowns are very strong and hardwearing, but are usually used at the back of the mouth, where they are not visible as they are metal colored. 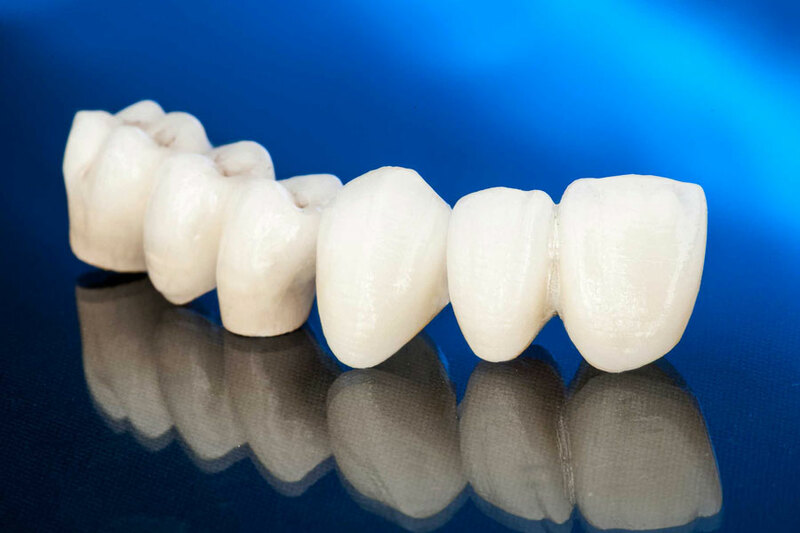 • Precious metal bonded to porcelain crowns: These consist of an inner metal framework to provide strength with a thermally bonded covering of porcelain. They have the advantage therefore of being both strong and aesthetically pleasing. A: The dentist will prepare the tooth to the ideal shape for the crown. This will involve removing most of the outer surface, and leaving a strong inner ‘core’. The amount of tooth removed will be the same as the thickness of the crown to be fitted. Once the tooth is shaped, the dentist will take an impression of the prepared tooth, one of the opposite jaw and another to mark the way you bite together. The impressions, along with any other information such as shade, will be given to our highly skilled technician, who will make the crown. A: No, unless the crown is fabricated only of metal, the crown will be made to match your other teeth exactly. The shade of the neighboring teeth will be recorded by a dentist to make sure that the color looks natural and matches the surrounding teeth. A temporary crown, usually made in plastic, will be fitted at the end of the first appointment to last until the permanent one is ready. Q: How long does the treatment take and will it hurt? A: At least two visits are needed and a local or general anesthetic is always used to ensure your comfort. The first appointment will be for the preparation, impression, and shade taking and fitting of the temporary crown, and the second to fit the permanent crown. Q: How long will crowns last? A: The life of a crown will depend on how well it is looked after. The crown itself cannot decay, but decay can start where the edge of the crown joins the tooth. It is very important to keep this area as clean as your other teeth, or decay may occur which could endanger the crown. Properly cared for crowns will last for many years. A: Once the fit and appearance of the crown has been checked- and approved by you – it will be cemented in place with special dental cement. A: Because the shape of the crown will be slightly different from the shape of your tooth before it was crowned, you may be somewhat aware of it to begin with. Within a few days it should feel fine, and you will become unaware of it.